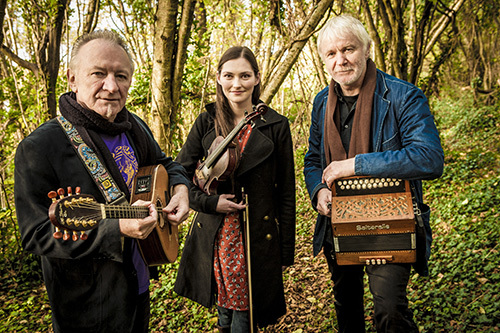 Zoe Conway, Donal Lunny and Mairtin O’Connor. THE inaugural Féile na hInse 2018, a new festival of traditional arts, kicks off in Moville tonight. The festival will feature concerts, workshops, sessions, film screenings, talks and a bus tour! Hosted by Inishowen Traditional Music Project (ITMP), the weekend will focus on the life, in music and song, of Honoria Galwey (1830-1925), a noted collector of music and song who lived and collected music in Moville and Derry. The weekend’s activities begin with a special concert, Recollections: Honoria Galwey: Life & Music, tonight in Moville Presbyterian Church. The concert will feature Grace Toland with Donal Lunny, Maureen Hegarty and Deirdre McGrory, selecting songs from the collection and performing in a variety of styles which hint at the quality and diversity of conent. Instrumental pieces from the collection will be performed by three newly-formed groups, the Inishowen Harp Ensemble led by Joleen ‘Henry’ McLaughlin, Piobaírí Inis Eoghain led by Paul Harrigan and Fiddle Slithers led by Clodagh Warnock and Roisin McGrory. Workshops in a range of instruments such as harp, uileann pipes, fiddle, concertina, banjo, piano accordion, button accordion, whistle, and flute will be provided on Saturday. The tutors are among the finest exponents of traditional Irish music, among them Zoe Conway, Damien McKee, Grainne Meyers, Darragh Murphy, Shane Bracken and three musicians returning to Inishowen to teach, Paul McClure, Paula and Melanie Houton. A free symposium, Honria Galwey: Life & Music, will be held on Saturday afternoon at 2.30pm, in Glencrow Hall, Moville. The event will delve deeper into the historical contexts of Honoria’s life and work. ITMP is honoured to host Ireland’s three of the legends of traditional Irish music in concert, Zoe Conway, Donal Lunny & Mairtin O’Connor, in Moville Presbyterian Church tomorrow with support from Cineál a ten-piece group of young Inishowen musicians.